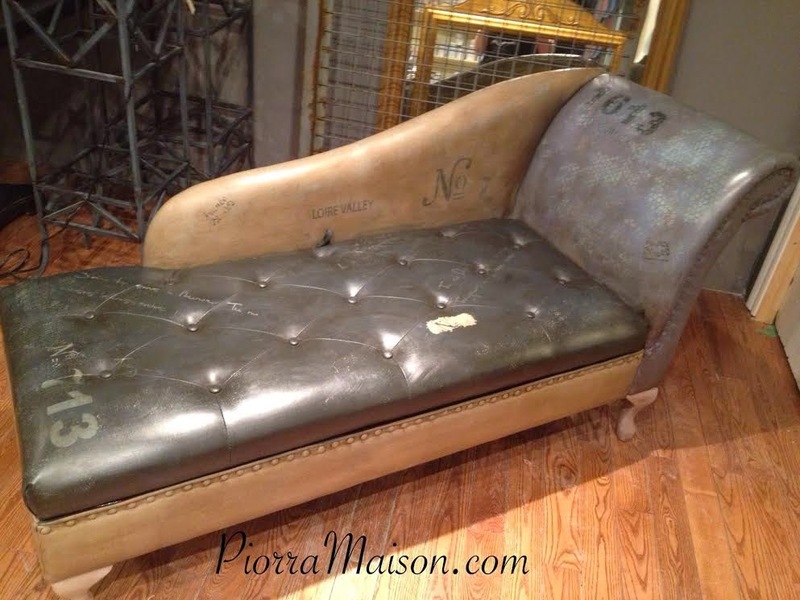 Piorra Maison - All things to inspire and Desire. Distributeur de la peinture décorative Chalk Paint™ à Montréal, Québec. Relooker vos meubles avec Chalk Paint™ (peinture a la craie). Imaginez… Aucun ponçage! Aucun décapage! Aucun apprêtage! Piorra Maison est le fière distributeur de Chalk Paint™ une peinture décorative par Annie Sloan à Montréal, Québec. Piorra Maison is the proud Stockist of Chalk Paint™ decorative paints by Annie Sloan in Montreal, Québec. I plunged into it. 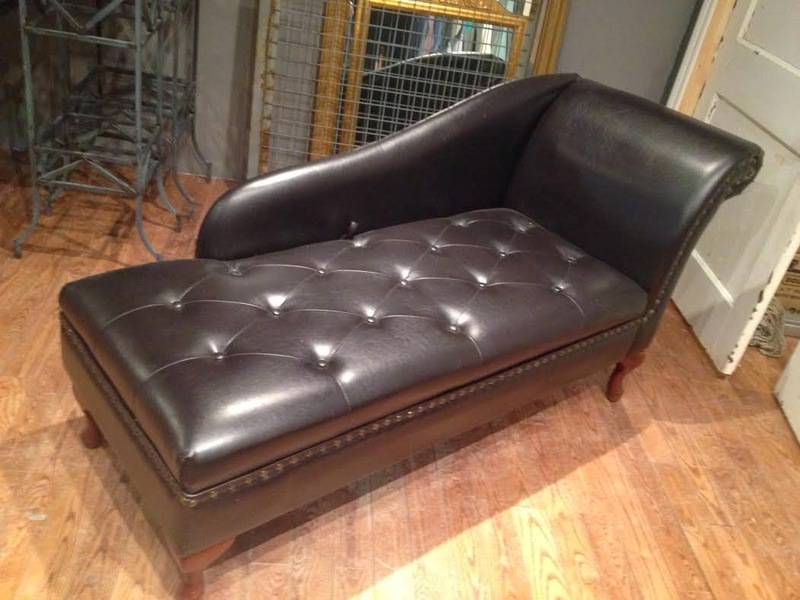 Someone (who shall remain anonymous) after a divorce could not stand to look at this leather lounge chair. We can all assume who it belonged to (wink, wink). I was hesitant to purchase it but after I gave it some thought...it was a blank canvas for me to create something I have been dying to try. Chalk Paint™ on leather. 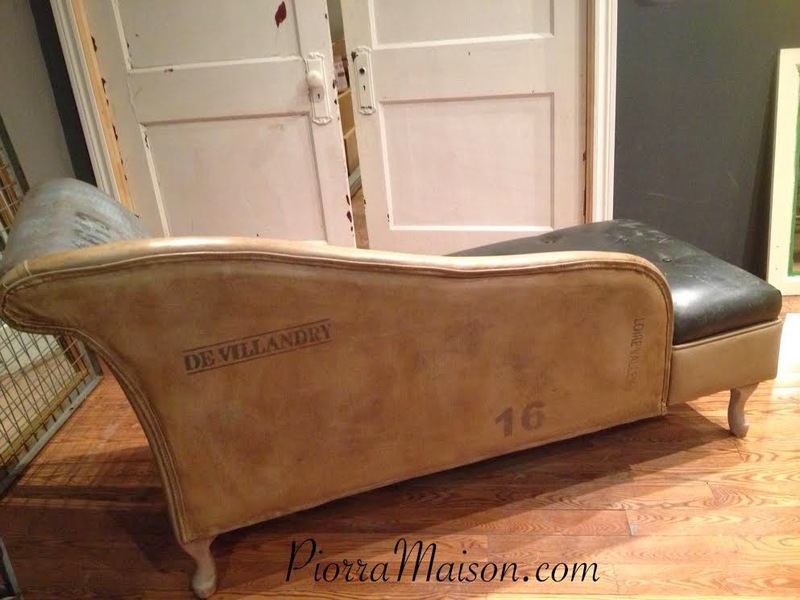 Really, if you have been thinking about painting an outdated leather piece I say go for it!! The touch and feel of it is quite amazing. Not stiff or rigid as we would all imagine it to be. I had some fun using multiple colours (colour blocking in neutrals) and odd objects for stamping and texture for an Industrial Chic style. After photo of Chalk Paint™ by Annie Sloan on leather. Chalk Paint™ decorative paint by Annie Sloan. Multiple well chosen colours for colour blocking. I chose Coco, Old Violet, Graphite, Aubusson Blue and Paloma, Sample sizes (118ml) are enough for this project. Any good quality paint brush will do but I used Annie's brushes to create texture and applied the paint quite thickly. Annie Sloan's Clear and Dark Soft Wax. Your Wax brushes, one for Clear and one for dark wax. (this allows you to go back and forth with your wax without contaminating it. Small scraps of burlap and bubble wrap. I used numeral and script stencils but you can use any stencil design your heart desires. TSP (Trisodium Phosphate) a must. TIME: 3hrs to complete this project :). The first rule of thumb before painting any surface is to clean with TSP (trisodium Phosphate) to remove any dirt, grease or grim that will prevent the Chalk Paint™ from adhering properly to the surface. It is well worth it to take 10 minutes to wash and rinse your surface with TSP to avoid any complications down the line. You may find TSP at your local ANNIE SLOAN Stockist location (some may not carry it) or any hardware store. It is sold in powder form (the most economical) or in a spray. We are now ready to have fun. I first started to apply my Graphite Chalk Paint™ on the base. You can start with any colour, as the paint is opaque and will cover up all your hit and misses that have gotten on other surfaces. While the Chalk Paint™ dries (15-25 min), proceed to the other surfaces to create the colour blocking effect. I really just slip slopped the Chalk Paint™ on in every direction to create an interesting effect once I waxed. The soft waxes enhance all your brush strokes to give a natural leather effect. Applying the Chalk Paint™ with the rustic technique. The Rustic technique is the easiest method you can use to apply your Chalk Paint™. Your children can even join in the fun. Seriously at this point it looks like a 5 yr old painted this but at the end of your project, after the wax application, the result is a beautiful handcrafted piece of furniture none of your friends will believe you created. It's that easy. Once the paint is dry, apply a second coat in the areas that need it. As you can see while I am in my creative mode I can get quite messy but I just love this part of the project. Caroline in atelier at Piorra Maison. I just randomly applied a stencil here a stencil there layering different numbers and letters, one on top of another. You can't go wrong!! If you don't like some of your work the Chalk Paint™ will easily cover it up. Creating different textures and stamping was the most enjoyable part if this project. 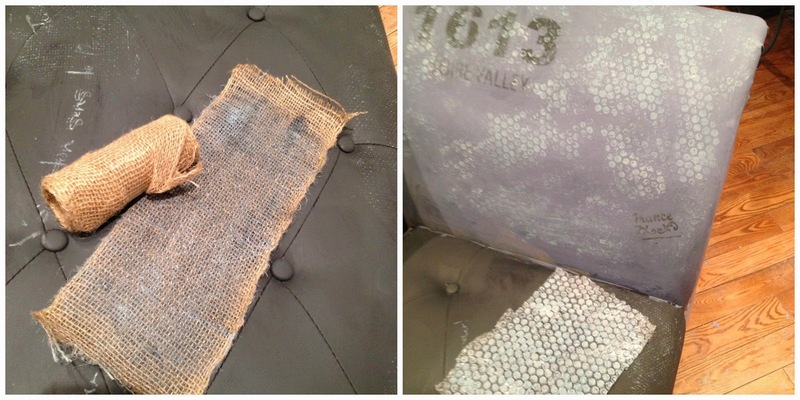 I used burlap and bubble wrap to create different textures on the surface. I just brushed on the Chalk Paint™, placed it on the surface and rubbed it with my hands to transfer the paint in random places. 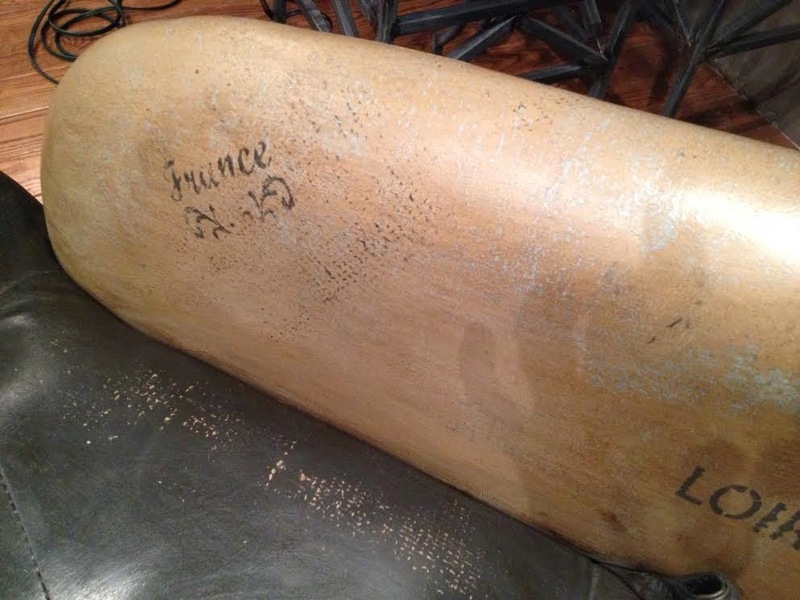 Below is a close up of the burlap stamped on the surfaces. I used the Coco on the Graphite, Graphite on the Coco and then mixed some of the Aubusson Blue, Coco, Paloma and Old Violet and stamped this mix of colour here and there to tie it all in together. 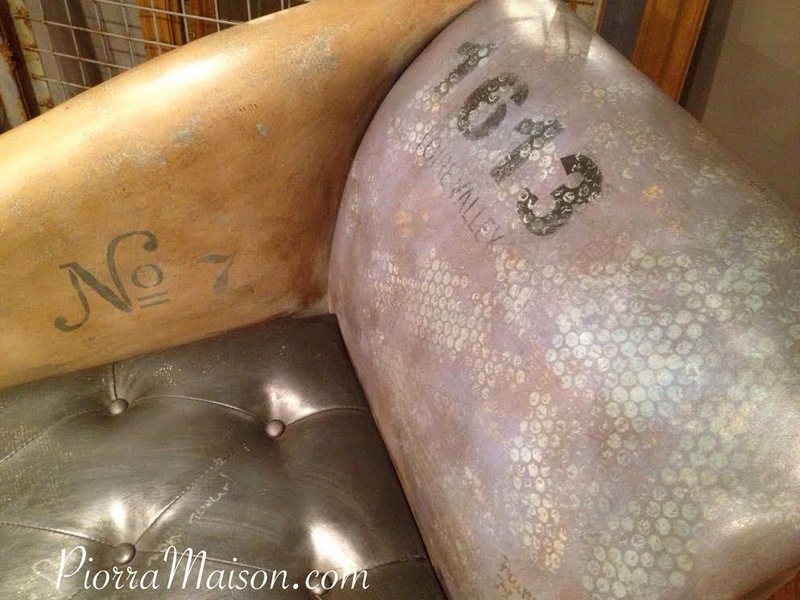 Chalk Paint™ on leather by Piorra Maison. The Bubble wrap is also a combo of the above colours but I did not premix them. I randomly painted the different colours on the bubble wrap keeping them separate to give a variance of colour on the surface. Hence the 8 brushes I used to slap the different colours on the bubble wrap. Frantic Artist at work, no time to wash brushes in between. Once you are satisfied with your project it is now time to wax your surface. Yes I said wax. Contrary to what most people think, the wax once cured will not rub off onto your clothing. The curing time takes about 30 days depending on the humidity of the room. After 24 hrs it is quite safe to use your piece if you are applying your wax properly. Many think that the surface will be better protected with a NICE thick coat of wax....THIS IS FALSE. The wax needs to be applied in thin layers. The Chalk Paint™ has porous properties that allow the wax to penetrate the paint and the excess is wiped off. If you apply a thick layer of wax you will only be wasting Good Wax and wasting time removing the excess wax on the surface that can no longer penetrate the paint. Always, Always apply a coat of clear Soft wax prior to applying Dark Soft wax. The Dark Soft Wax must be applied over a FRESH COAT of clear wax. A second or third application of Clear Soft Wax can be applied on high traffic surfaces but you must wait 24 hours in between each coat. The Dark Soft Wax is used mostly for antiquing effects, your Clear Soft Wax is your most important for sealing your Chalk Paint™. For this project...once my layer of Clear Soft Wax was applied and the excess wiped off I proceeded with a layer of Dark Wax applied in a circular motion to mimic a leather effect. You can see it in the photo above. And here we have it.....the finished Lounge Chair. 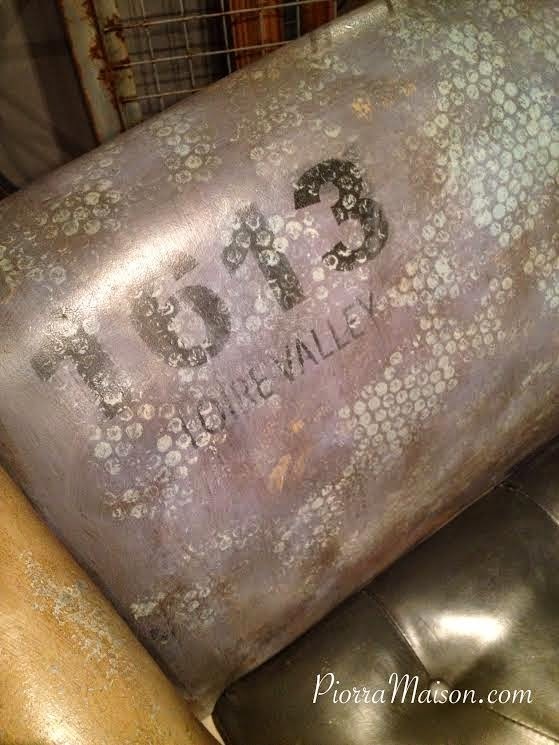 Painting Chalk Paint™ on faux leather (cuirette) is also gorgeous. It really takes the fake look out of faux leather (cuirette). So if you are hesitating to start your Chalk Paint™ project on leather, Don't... it really gives a beautiful look to outdated or worn out leather. Piorra Maison located in Montreal and Pointe-Claire can also custom finish your old and outdated pieces in our studio or on location using only CHALK PAINT™ decorative paint by ANNIE SLOAN. The authentic and original high quality Chalk Paint™ created over 23 years ago in Europe by Annie Sloan. Come by and visit us for more info on Chalk Paint™. As an official Annie Sloan Chalk Paint™ retailer (a.k.a stockist) we can answer all of your questions if you are the DIY'er or not to create gorgeous finishes on your outdated or family heirloom pieces. And now back in the day when I blogged more frequently, I always had a quote of inspiration relating to my blog post. This one should last a few months because that is how often I blog. For all you DIY'ers or Not who hesitate to just get it on. The most frequently asked questions about Chalk Paint™ decorative paint by Annie Sloan. Questions and answers: Source, Annie Sloan Unfolded website. Q. Do I need to sand before painting with Chalk Paint™? Q. What type of brush should I use to apply Chalk Paint™? A. The best way for you to find the perfect color for your project is to visit your local Annie Sloan Stockist. Each of our Stockists has been trained in the Annie Sloan Method and they can guide you with making the perfect color choice. 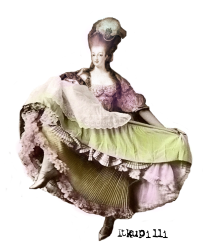 If you don’t know your local Stockist, please visit www.anniesloanunfolded.com and click on “Find a Retailer.” Enter your zip code and a listing of Stockists closest to you will appear. Q. Are Chalk Paint™ and Soft Wax safe for use on baby cribs, etc? Q. Can I paint my walls with Chalk Paint™? Q. Can I apply Chalk Paint™over a surface that was previously finished with linseed oil? Q. Is Graphite Chalk Paint™ a true black? Q. Can I paint the slate around my fireplace with Chalk Paint™? Q. Can I paint my kitchen countertops and backsplash with Chalk Paint™? Voir Site Web Piorra Maison Inc.
Distributeur de Chalk Paint™ by/ par Annie Sloan Stockist, Québec, Canada. Canopy beds, Drapery, so romantic.